Fishing Guide: Why Grey Reef? Wyoming fly fishing is like no other experience you’ll have on a river. The varied water sources and difficulty levels vary around the state, but fly fisherman know to come to Grey Reef when they want a productive fishing trip. Much of Grey Reef is located on private land—the water is public domain, but the land underneath the water is private, making wading or anchoring a boat trespassing if you don’t first have permission—leased by the Reef Fly Shop. When you choose a fishing guide from our staff, you have over 90 miles of stupendous fishing ground to cover, either by boat or wading. The Grey Reef section of the North Platte River emerges from the dam of Grey Reef Reservoir, a small impoundment or afterbay a short distance downstream of the much larger Alcova Reservoir. The afterbay regulates the flow of water downstream and, as a happy side effect, it creates a world-class Wyoming fly fishing destination. 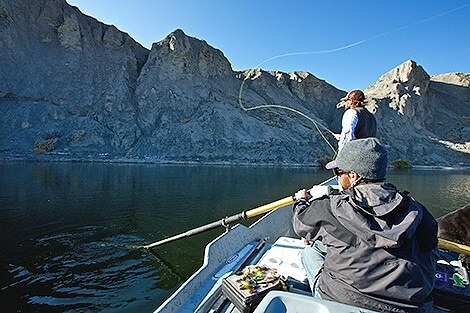 The Grey Reef has it all when it comes to a well-rounded trout fishery. Beginning fly fishers accompanied by a fishing guide and advanced anglers alike will find it hard to leave once they have experienced fishing at Grey Reef. There are a number of ways to go about catching trout at Grey Reef, but below are some of our tried and true recommendations for a shot at a day of fishing for the record books. 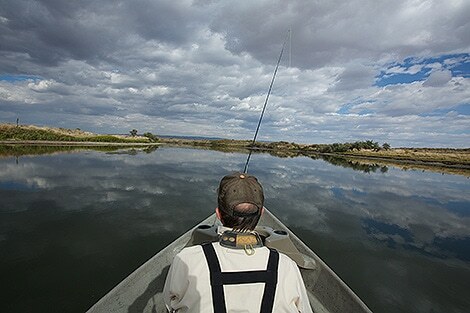 Nymphing: The standard method of Wyoming fly fishing the Grey Reef section of the North Platte River. It is typically done with a two fly rig located 12 to 18 inches below a weight and an indicator located 6 to 10 feet above that. A long dead drift is the most productive means of tricking Grey Reef’s trout. This information is always available at the fly shop. Streamers: A great way to catch trout on the North Platte River. It’s typically done with a two-fly rig on a leader between four and 10 feet long. We feel streamer fishing is most productive between the end of June through the middle of November, but Grey Reef’s trout will take a streamer at any time during the year. Again, you are welcome to call The Reef Fly Shop for current conditions and advice. 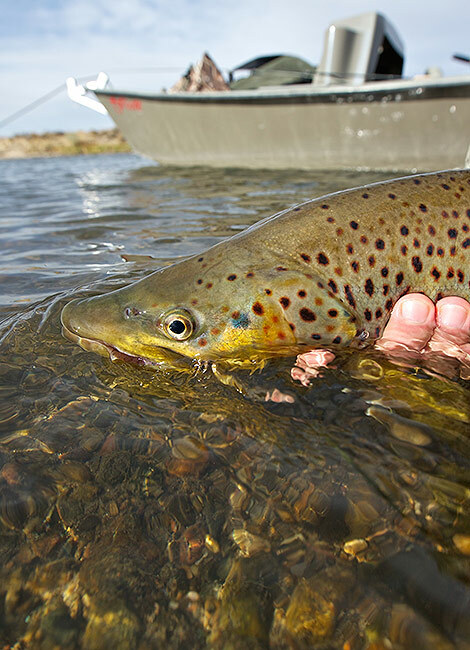 Dry fly fishing: The least predictable method of catching trout at Grey Reef. Our fish are very happy eating subsurface, but will come up to the surface when the conditions are right. Look for pods of risers, as singles will generally spook more readily. Our favorite dry fly hatches are any bugs that bring them to the top. Fishing guide tip: Consider pinching the barbs on all of your flies when you fish Grey Reef. It is not illegal to fish with barbed flies, but fishing barbless is a solid conservation practice. Releasing fish quicker and doing less physical damage is the least we can do to repay for the fun they provide us.